The Speedway Pro Pneumatic Caulking Gun dispenses Caulk, adhesives and sealants from standard cartridge. Made of solid metal this Speedway Pro Pneumatic Caulking gun is a must for any handyman. Milwaukee's M18 Cordless 2-Speed Grease Gun delivers maximum pressure and unmatched versatility, offering an industry leading 10,000 PSI max operating pressure and a patent pending pre-set grease counter that allows service and maintenance professionals to dispense precise amounts of grease. The tool's 2-speed design offers users the ability to select between max pressure and max flow rate. Other unique features include an on-board LED light, a lock-on/lock-off trigger, and a plunger rod with markings to gauge how much grease is left in the barrel. The tool's stand up design and shoulder strap capability offer convenience, while limiting fatigue and the 48-inch flexible hose offers greater accessibility when greasing hard to reach fittings. This tool is also compatible with a clear barrel accessory (49-16-2646). 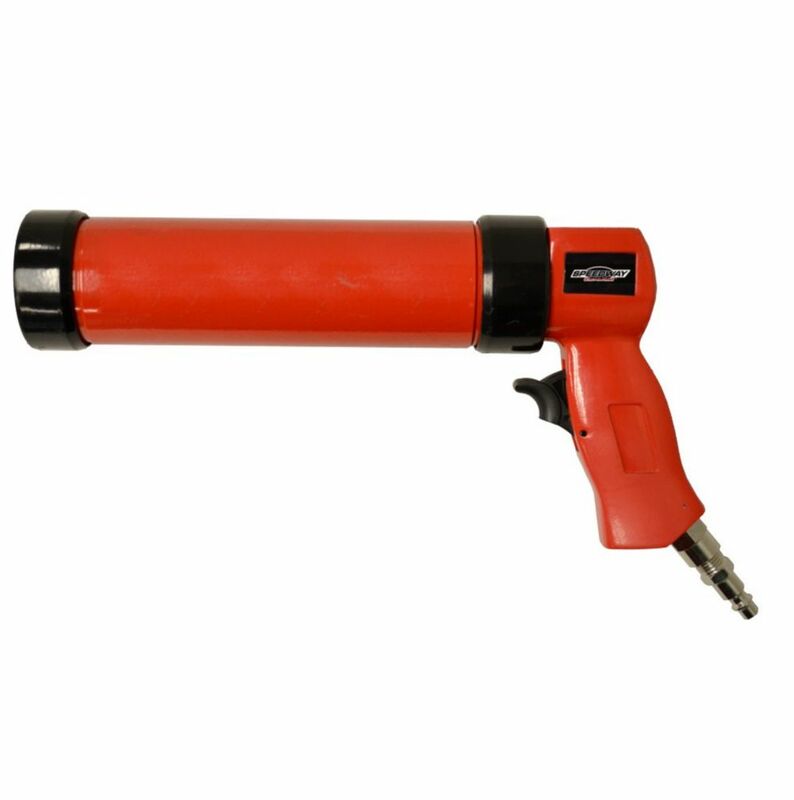 Powered by an M18 REDLITHIUM battery pack (sold separately), this is the industry's only 18V grease gun that's battery is compatible with a system of tools. The Powermate air sandblaster with 50 lb. hopper is perfect for removing rust, scale, and paint; or etching glass and weathering wood. The gravity feed system assures a continuous positive flow of blasting material. Sandblaster has a 90 PSI operating pressure and a 7.0 CFM @ 90 PSI air requirement. Air inlet is 1/4" NPT. Includes sandblast gun with ceramic nozzle, 3 air jets (1/8, 3/32, 5/64), 50 lb. hopper, 14 x 3/8 rubber hose, Allen wrench, hose clamps, ANSI approved safety goggles, and dust hood. Speedway Pro Pneumatic Caulk Gun The Speedway Pro Pneumatic Caulking Gun dispenses Caulk, adhesives and sealants from standard cartridge. Made of solid metal this Speedway Pro Pneumatic Caulking gun is a must for any handyman. Speedway Pro Pneumatic Caulk Gun is rated 4.5 out of 5 by 44. Rated 5 out of 5 by James from I like it!!... I like it!! Rated 5 out of 5 by gMan from The gun works above my expectation! Have been using it... The gun works above my expectation! Have been using it non stop for about a month and still going strong! Highly recommend! Rated 4 out of 5 by Harley from The function is great, but the trigger is designed for... The function is great, but the trigger is designed for the fingers of a 5 year old girl. (It's shaped for a tiny little finger, so it's awkward to use). Other than that, it's great. Rated 1 out of 5 by JJ from Another "good idea on the chalkboard", however, it has major problems. The pressure is set at the... Another "good idea on the chalkboard", however, it has major problems. The pressure is set at the regulator to 10-20 psi depending on the caulking type and temperature, yet the caulking itself comes out at differing rates. In addition, the air leaks around the caulk cartridge "push piston/seal" and sporadically spurts and spits caulking with air, turning any effort to obtain a clean line, as opposed to a splotch, impossible. I can't think of a way to fix this thing or even make it more useable so I cannot with all conscience recommend it. Speedway must have diluted the REAL reviews with good ones because there is NO WAY this could be evaluated as a working pneumatic caulk gun. Rated 5 out of 5 by Anonymous from Is worth more $20 This thing is awesome, ill never use a manual caulk gun again. Fast, smooth, can lay a perfect bead of caulk/sealant and stops instantly when u let go of the trigger. If your looking at this then buy it, you will not have any regrets.